Good Friday : Stations of The Cross in Camp Church at 12.00 noon. Liturgy of The Passion in Inch Church at 3pm. Holy Saturday: Easter Vigil in Camp Church at 7.00 pm. Easter Vigil in Annascaul Church at 8.30pm. Easter Sunday: Masses as follows: Annascaul Church at 10am; Inch Church at 10.45 am Camp Church at 12noon. Happy Easter to all at home and overseas. Concert at Old School, Camp on Saturday 6th April at 8.00 p.m. Proceeds to St. Marys Church, Camp renovation fund. Tickets now available at O Dwyers Retail centre and 086 4089504. SENIORS: We kicked off our county league in great fashion over the weekend, recording a 2-9 to 1-11 win over Currow. Playing with the aid of a breeze, we took our time getting into the game, and scores were at a minimum in the opening quarter. Aidan and James Crean were excelling with the direct ball into our full forward line, with both getting on the score sheet. Currow refused to lie down however, and they kept in contact with scores of their own, despite the best efforts of Gareth O Donnell and David Clifford in the full back line. Long, high ball was used to good effect soon after, as Aidan Crean used his strength well to score two excellent goals in the space of five minutes. Knowing the wind was a major asset, we used it to good advantage to lead well at half time, 2-7 to 0-4. The second half was all Currow though, and they clawed their way back into the game and were only down a point with ten minutes remaining. Without a score in the second half at that stage, we were under extreme pressure, added to by Emmet Kennedy’s second yellow card. Still, we increased our work rate to compensate for the sending off and held out for a one point win. Best for us were Jason Hickson, Aidan and James Crean, and Shane Foley. TEAM: Tommy Pierce, David Clifford, Gareth O Donnell, James Scanlon, Colm Barry, Kenneth Quirke, Eamonn Hickson (0-2), Emmet Kennedy, Jason Hickson (0-1), Shane Foley, Michael Driscoll, James Crean (0-2), Aidan Crean, (2-4), Genie Farrell. SUBS USED: Keith Moynihan, Declan Lindsey. We are playing John Mitchels on Saturday in the Intermediate Championship in Annascaul. Time to be confirmed. All support is greatly welcomed. Sympathy is extended to John Chambers and family, on the death of John’s Brother Jimmy Chambers, Carrickmacross, Co. Monaghan. Rest In Peace. The death of John Herlihy, Tansley Court, Tralee and London and native of Lougher, Annascaul occurred on Wednesday last. Removal took place from The Gleasure Funeral Home on Thursday to the Sacred Heart Church, Annascaul. Sympathy is extended to his sister Breda Brosnan and family, Lispole and all his relatives and friends. Sympathy is also extended to Wyles family Aughascala on the recent death of John Wyles in Englnad. Go nDéana Dia Trocaire ar a n-anamacha. A concert in aid of St. Marys Church, Camp renovation fund will be held in The Old School, Camp on Saturday, April 6th. Be sure to book your ticket on time. Tickets available at O Dwyers Retail Centre and 086 4089504. A Bric-a-Brac sale in aid of Cystic Fibrosis sufferer Chloe Glennon and Chernobl Childrens Fund (Kerry area) will be held at The Clubrooms, Castlegregory on Sunday, 24th March from 3.00 to 5.00 p.m. Books, magazines, CD’s DVD’s, alcohol, cakes and non perishable goods gratefully accepted. Items can be left at the Castlegregory Community Hall, West End on Saturday, 23rd. March between 2.00 and 4.00 p.m. Donations and further enquiries please to Susan Hogan, 087 2438030. Your support will be appreciated. 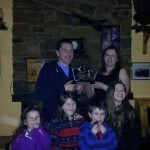 The annual Junction Bar Cheltenham Champion tipster was won by Conor Slattery, runners up, Bernadette Fitzgerald, Brigid O Connor and John and Susan Fitzpatrick. A great few days as always for all the local punters who couldn’t make it to Cheltenham, but had as much fun at home ! Congratulations Conor !! E975 is the final figure raised in the recent Shave or Dye fundraiser in Ashes Bar. Again well done to everybody who supported. All proceeds to The Irish Cancer Association. Congratulations to Jamie O Donnell, Knockglossmore, Camp and Liz Murphy, Blarney, Co. Cork who were married on Friday last at the Church of The Immaculate Conception, Blarney, Co. Cork and held their wedding reception at The Castle Heights Hotel, Killarney. All enjoyed a wonderful day. Wishing you both health, happiness and good fortune into the future! Go n-eirí an t-ádh libh ! Activities as follows – Thursday, March 14th, calling all knitters for our Arran stitch project. Annual Easter Camp March 25th – 28th 10 am – 3pm. Preschool age upwards,welcome. We are also holding a Family Fun BINGO evening in the old school on March 24th at 3.30pm, should be fun for everyone!! €5 per book, spot & raffle prizes, all proceeds to Camp Childcare Centre. Children must be accompanied by an adult. SENIORS: We lost out to Lispole over the weekend in our final West Kerry league game on a scoreline of 1-20 to 2-9. We started well, with Jonathon Deane finding the net to give us an early lead. Winning the breaking ball in the middle, we led by four points at the quarter way mark. Unfortunately, Lispole upped their work rate, cutting the supply of ball to our main scorers, Aidan Crean and Jonathon Deane. Despite David Clifford and Ger Farrelly’s best defending, we were down at half time by six points. The second half provided little respite for us, as Lispole found the net within minutes to give us a mountain to climb. And again despit of Emmet and Genie’s efforts, we never got close enough to threaten Lispole after that. Best for us were Kenneth Quirke, Emmet Kennedy, Genie Farrell and Jonathon Deane. TEAM: Conor Guilfoyle, Paddy O Shea, Eamonn Hickson, David Clifford, Colm Barry, Daniel O Connell, Ger Farrelly, Emmet Kennedy, James Scanlon, Kenneth Quirke, Genie Farrell, Shane Foley, Aidan Crean, Jonathon Deane, Declan Lindsey. Subs: John Bowler, Jaime Quirke, Shane Scanlon. ‘Sé seo seachtain na Gaeilge, Má tá gaeilge agat, labhair í ! March 28th Holy Thursday, meeting will not be held. The death of John Herlihy, Tansley Court, Tralee and London and native of Lougher, Annascaul occurred on Wednesday last. Removal took place from The Gleasure Funeral Home on Thursday to the Sacred Heart Church, Annascaul. And John was laid in Inch Cemetery on Friday following requiem Mass. Sympathy is extended to his sister Breda Brosnan and family, Lispole and all his relatives and friends. Go nDéana Dia Trocaire ar a anam. Living Links Kerry wish to thank all those who sponsored races and those who supported the fundraising night in any way at The Tralee Greyhound Stadium on Friday night. E2,515 was raised on the night with more coming in. A dog named “Buaiteoir” trained by John Kelliher, Castlegregory and owned by a Castle syndicate won the first race of the night. Elaine Guiney, Meelin, Co.Cork was chosen as “most appropriately Dressed lady”. Living Links Kerry supports those bereaved by suicide and provides ongoing training on suicide prevention as well. 4199675/livinglinkskerry@gmail.com. Helpline – 087 9006300. 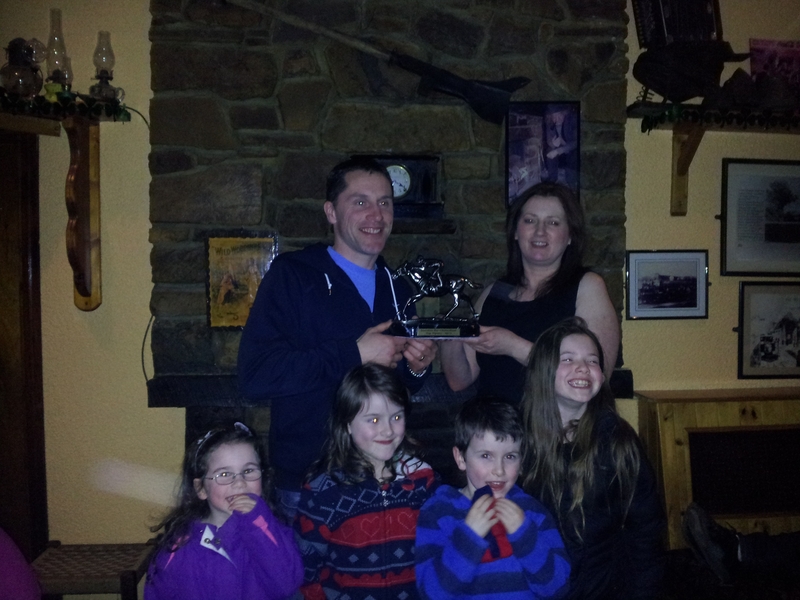 Paudie Moore celebrated a special birthday in Ashes Pub, Camp on Saturday night. May you enjoy many more, Paudie, Go maire tú an Céad ! West Kerry Final Un14: Congratulations to Annascaul/Lispole on their West Kerry Un14 Title win over Dingle last Saturday 9th March in Lispole. First half Sean Kennedy – 3pts with James Ashe a well taken goal, Brian Kennedy , Sean Brosnan and Rian O’ Sullivan who kicked some fine long range points left it 1-10 to 0-1 at half time to Annascaul/Lispole. In the 2nd half with wind advantage to Dingle, Dingle closed the gap at the end to leave it 2-7 to 1-12 in favour of Annascaul/Lispole at the final whistle. Well done to everyone involved in this great victory, Brian Kennedy (captain) and to the mentors who trained the team since the end of January: Tim Falvey and David Cliifford. Cogratulations from Annascaul Coiste Na nOG to the Un14 Annascaul/Lispole Team on this excellent win and performance. Next Fixture: Un14 Div 5 County League Round 1 – away to Cordal/Scartaglin on March 29th (Good Friday) @ 5.00pm. John Egan Gathering Tournament: Annascaul/Lispole Un14s will be taking part in the John Egan Gathering Tournament in July which will be held over three days with teams from all over Ireland competing. Annascaul /Camp/Inch will host one of these clubs of 25 players and their mentors during this tournament. Annascaul/Camp/Inch Community Games: Congratulations to the UN14 Tag Rugby Team and manager Brendan Kennelly, on winning 4th place (certs) in the County Finals last Sunday at the IT Tralee in the all weather pitch. Also well done to the Un11 team and manager Christopher Griffin. Considering both teams are young and had little training time they performed very well in cold and wet conditions on Sunday. Thanks to the parents who brought the team players and supported them on the sideline. Well done to Dara Newsome on winning a cert (4th place) in the Art Competition recently and to all those who took part in the art and handwritting county finals. Up-coming fixtures: Swimming Un8-Un16 Boys/Girls in Tralee Sports Complex Monday 18th March. Pitch and Putt Un16 Friday 29th March, Model Making 7th April, Un12 Boys Outdoor Soccer 14th April , Un12 Girls Outdoor Soccer 28th April. Please contact member of committee for more information on the above: 086-3180850/086-0865287. Defibrillator and RefresherTraining for adults was delivered by Cardiology Nurse Specialist Fiona Barton at Camp Old School on Saturday last. There are 4 defibrillators located in the community as follows – Ocean View Nursing Home, O Dwyers Retail Centre,The Community Sports Field and Moan Laur, Slieve East, Camp. There are over 50 people trained in CPR in Camp at this point. Important information as follows – In the event of a person collapse Phone 112 or 999. Then administer simple CRP compressions (if possible) until help arrives. You might save a life ! A full training programme will be delivered again in the autumn. Watch out for dates ! Camp Defibrillator Committee organised the training and do tremendous work keeping the defibrillators operational and fundraising as needed. Sheila, Val and all the members are owed a sincere thanks and a debt of gratitude from all of us ! The Shave or Dye event in Ashes Pub on Friday night raised over E700 towards The Irish Cancer Society. Louise Kelliher, Hair Heaven Hairdressing Salon, Camp and Karen did a fantastic job. We have some Mohicans and very colourful heads around the village after the night. Congratulations to each and every one of them for their wonderful generosity of spirit in aid of this great cause. Tommy Scanlon, Cappaclough started the ball rolling with a tremendous effort raising E405 on a phone around Friday evening. Again well done to everybody and it was a great night as well !! Micko and staff provided food and Hannah organised the raffle. The death of Ella Edwards (nee Griffin) Lisbeg, Oakpark, Tralee occurred last Saturday in Ocean View Nursing Home Camp. Ella and her late Husband Bill whose links to Camp was through his late mother Nora Deane, enjoyed many happy hours and days walking on the mountains and hills around Camp and West Kerry. Ella is survived by her sons, Séan and Ciaran, grandchildren, her brothers in law, George and Joe, many relatives and friends. Ella’s Husband Bill R.I.P. and son Liam R.I.P. predeceased her. Sympathy is extended to all the family and friends. Congratulations to Dara Newsome who won 4th place(cert) in Kerry Community Games Art finals in Listowel last weekend. Well done to all the boys and girls who competed in the art and the handwritting competitions. Next Fixtures: Swimming Un8-Un16 boys/girls, Finals are on Monday, 18th March in Tralee Sports Complex. Entries for swimming must be in this week. Please contact member of committee if interested. SENIORS: We took part in the Paidi O Sé tournament with mixed results. Playing Cooley Kickhams from Louth on Saturday morning, we got off to great start, winning the quarter final with ease. Hours later, we were in Blennerville playing Achill from County Mayo, and pulled through after a very tough encounter. Unfortunately, we picked up a number of injuries over the first two games, which meant we had a weakened team on Sunday in the final. Playing against St. Pats, we began well and were unlucky to trail at the break by four points. As the game wore on, fatigue caught up with us and St. Pats ran out comfortable winners. Regardless of the final result, we benefitted greatly from the tournament over the weekend, with every member of our panel getting considerable game time. Best for us over the weekend were Genie, Ger Farrelly, Gareth O Donnell, James Scanlon and Declan Lindsey. Annascaul GAA would like to thank the organisers of the tournament for the invitation, we were delighted to play our part in honouring Paidi’s memory. We lost out to Lispole in our final West Kerry league game on a scoreline of 1-20 to 2-9. We started well, with Jonathon Deane finding the net to give us an early lead. Winning the breaking ball in the middle, we led by four points at the quarter way mark. Unfortunately, Lispole upped their work rate, cutting the supply of ball to our main scorers, Aidan Crean and Jonathon Deane. Despite David Clifford and Ger Farrelly’s best defending, we were down at half time by six points. The second half provided little respite for us, as Lispole found the net within minutes to give us a mountain to climb. And again despit of Emmet and Genie’s efforts, we never got close enough to threaten Lispole after that. Best for us were Kenneth Quirke, Emmet Kennedy, Genie Farrell and Jonathon Deane. TEAM: Conor Guilfoyle, Paddy O Shea, Eamonn Hickson, David Clifford, Colm Barry, Daniel O Connell, Ger Farrelly, Emmet Kennedy, James Scanlon, Kenneth Quirke, Genie Farrell, Shane Foley, Aidan Crean, Jonathon Deane, Declan Lindsey. Subs: John Bowler, Jamie Quirke, Shane Scanlon. Fundraising Race Night at Kingdom Greyhound Stadium, Tralee on Friday, 8th March at 7.50 p.m. Adm. E10, children free, family night out. Information – Kathleen 087 4199675/livinglinkskerry@gmail.com. Helpline – 087 9006300. Un14 West Kerry League: Annascaul/Lispole maintained their good run in the West Kerry League with a win over Castlegregory away last Sunday. Best of luck to this side who now face Dingle in the Un14 West Kerry Final this Saturday 9th March, in Lispole @ 5pm. Best of luck to the Un11/Un14 Tag Rugby teams and manager Brendan Kennelly in the County Finals this Sunday 10th March In Tralee. SENIORS :We lost out to Lispole over the weekend in our final West Kerry league game on a scoreline of 1-20 to 2-9. We started well, with Jonathon Deane finding the net to give us an early lead. Winning the breaking ball in the middle, we led by four points at the quarter way mark. Unfortunately, Lispole upped their work rate, cutting the supply of ball to our main scorers, Aidan Crean and Jonathon Deane. Despite David Clifford and Ger Farrelly’s best defending, we were down at half time by six points. The second half provided little respite for us, as Lispole found the net within minutes to give us a mountain to climb. And again despit of Emmet and Genie’s efforts, we never got close enough to threaten Lispole after that. Best for us were Kenneth Quirke, Emmet Kennedy, Genie Farrell and Jonathon Deane. TEAM: Conor Guilfoyle, Paddy O Shea, Eamonn Hickson, David Clifford, Colm Barry, Daniel O Connell, Ger Farrelly, Emmet Kennedy, James Scanlon, Kenneth Quirke, Genie Farrell, Shane Foley, Aidan Crean, Jonathon Deane, Declan Lindsey. Subs: John Bowler, Jamie Quirke, Shane Scanlon. The first anniversary service for Comdt. Gareth Evans R.I.P., will be held in Kilgobbin Church of Ireland Church on Sat 9th March at 5pm all welcome. A concert in aid of St. Marys Church, Camp will be held on Friday, April 6th. in Camp Old School. Your support will be appreciated. Everybody welcome. Living Links Kerry are organising a fundraising night at Tralee Greyhound Track on Friday, March 8th. All proceeds in aid of Living Links Kerry Suicide Outreach Support for persons bereaved by suicide. Everybody welcome, any support appreciated. Kerry Living Links Freephone Number is 0879006300. SENIORS: We took part in the Paidi O Sé tournament over the weekend with mixed results. Playing Cooley Kickhams from Louth on Saturday morning, we got off to great start, winning the quarter final with ease. Hours later, we were in Blennerville playing Achill from County Mayo, and pulled through after a very tough encounter. Unfortunately, we picked up a number of injuries over the first two games, which meant we had a weakened team on Sunday in the final. Playing against St. Pats, we began well and were unlucky to trail at the break by four points. As the game wore on, fatigue caught up with us and St. Pats ran out comfortable winners. Regardless of the final result, we benefitted greatly from the tournament over the weekend, with every member of our panel getting considerable game time. Best for us over the weekend were Genie, Ger Farrelly, Gareth O Donnell, James Scanlon and Declan Lindsey. Annascaul GAA would like to thank the organisers of the tournament for the invitation, we were delighted to play our part in honouring Paidi’s memory.